First N Ten is a Football inspired outdoor game that combines the best aspects of disc toss, KanJam, horseshoes and ring toss. A 4 player game, in teams of 2, this new and fun outdoor game is sure to give your tailgate games or backyard BBQ a boost of fun. Every few years comes a fun and innovative 4-person backyard game that will become a classic one day. First-N-Ten is definitely one of those. If you can not tell by the name already, First-N-Ten was inspired by a football concept. Instead of throwing at a garbage can like KanJam, you get to throw the frisbee at a field goal target to score. If you are lucky, you may even land the ring around one of the top of the goal posts for even more points. First N Ten is designed for children 12 years and older. But after bringing it out at our last family BBQ should have seen how excited our 3-year-old was just to play around with the game. The team at First-N-Ten sent us a free game for an honest review. It has since earned a prize spot in our backyard game collection and even more coveted space in our camping box. Keep reading for more information and on how to play. 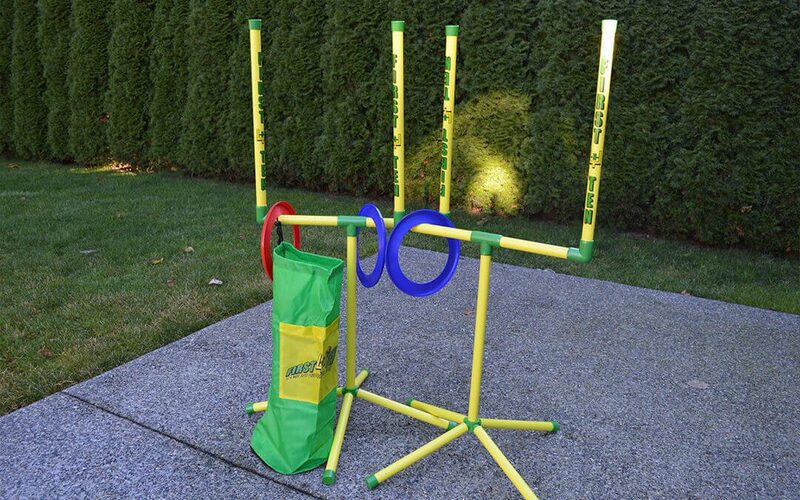 Included in the First N Ten game is 2 field goals, 4 flying rings and a carrying bag. To setup the field goals, assemble the legs, crossbars, uprights, post pole connected by the elbows and 5 pin base. Add the caps to the bottom of the legs. We found assembly and take down to pretty simple for this game. And the posts are pretty stable so they don’t fall down during game play. First-N-Ten is an easy game to learn, portable and light weight, and takes just a few moments to setup. Once you have gathered a few friends, found a nice level spot to play, and setup the posts you will be ready to play. Setup the goal posts about 30 feet apart, shorter or farther apart adjusting for skill of the players. The official rules state 40 feet apart for tournament play. First-N-Ten is a 4-player game with teams of 2. Partners sit at opposite sides and alternate tossing after each round. Each team has 2 rings per round. Do not cross the imaginary line in front of the field goal while throwing. Throw a test round to see which team goes first, the team that wins can choose to throw first or second. Read more in the redemption round about strategy here. The goal of each round is to score points by throwing the flying rings through the goal posts, landing them onto the goal post ring, or hitting the goal post. Keep reading for the points below. Partners can assist your team mates throw by doing what is called a “tip drill”. This means they can tip your partners ring for the same 1, 3, or 5 points. However, if the ring passes through or around the uprights you are not allowed to deflect it back. First-N-Ten is a simple game to learn with easy to learn score keeping. You can get different amounts of points for hitting the posts, throwing through the posts, or knock the ring onto the post. For all of the options, your partner can assist you near the goal to ricochet your flying disk onto the goal. 1 point – Hitting the yellow upright posts anywhere. 3 points – Throwing the disc through the uprights like a field goal. 5 points – ring one end around the top posts of the upright. Instant Win – If both of your rings land around the upright in the same turn you get an instant win. The other team does not get a chance for a redemption throw. First team to get exactly 21 points is without going over wins! If you go over, the points you would have earned for both rings are deducted from your total score. For example, you have 15 and get 8 points, because your score is 23 and scored over, 8 points are decuded from your current 15 score. In order for a winner to be declared in First N Ten, it’s only fair that each team has equal opportunity to throw. Therefore, if the team who throws first gets to 21, the team throwing 2nd is allowed one redemption throw. This ensures that the total number of throws in the game is the same. If the team that throws 2nd gets to 21 first, then they are declared the winner. When choosing the team who decides to throw first or second, that team might even just choose to throw 2nd. That way they will get the redemption round advantage. If in the redemption round, the team that is throwing for redemption scores the 21 points needed the game then enters Sudden Death. In Sudden Death all four players get a chance to throw in a round. At the end of the round, the team with the most points, wins the game. We really enjoyed playing this First-N-Ten tailgate game. But we loved it even more once we read about the story and couple who invented it. Michael and Jean Wolf, a married couple from Buffalo who came up with the idea after spending a summer playing all types of games. Then one day, while seeing a goal post at the supermarket sparked an idea. They rushed home to bring dream to conception. After a few initial designs, some of those were attaching a five-gallon bucket to a piece of plywood. The first prototypes were developed into a great product. They even sell most of the games out of their basement. The patent pending 5-piece design compact, portable, and only weights about 7 pounds. The game is made from furniture grade PVC that provides tremendous strength. I think we have all tried playing ladder ball at times, and had it come apart, this game did not come apart for us. We have played a lot of games, and this is one really good quality game made in the USA with parts made to last. And it should, the price point for the game is a premium price tag at approximately $60 plus shipping. Even though there are no official drinking rules for First-N-Ten, throwing the flying disc leaves one hand free, perfect for holding a cold beverage. For your next a tailgate or backyard party, anyone can bring chips and dips, but you will be the hit with your tossing game. Make your own variations. but in addition to the rules above we play these first n ten drinking game rules. Make sure to comment your variations below! If you got this far and can not tell, First-N-Ten will be a huge hit at your next party. Or a huge hit if you are camping, tailgating, at a backyard BBQ, or at a child’s birthday party. Everyone will entertained for hours, both spectators and players. As the slogan from First N Ten creators say, “it’s not just for football anymore.” Personally, we do think it’s not quite a football game, but it’s football themed with the goal post. Find out more from First-N-Ten or Buy on Amazon. Game description: First-N-Ten is one of the best Frisbee Games we have every played! Learn How to Play and where to Buy First and Ten for your Backyard Games Collection.